We also turn 50...Wow where did all the time go?? Join us....you still have time! Registration below...spend the day learning new wedding techniques. We all LOVE to learn new things! A Wedding Class for the professional florist. We will create hand bouquets, cascading bouquets and personal flowers. Learn new techniques for your wedding work. Making your wedding season selling a breeze with all the new design confidence you have. This amount is due in full to reserve your design table. Payments made with any major credit card or with Pay Pal. This 12 day or 2 evening Exploration of Floral Design class will teach the basic principals of floral design, and so much more. Each day will have a morning/evening lecture and afternoon/evening of hands on designing. Students will participate in the processing and handling of fresh flowers each day for the lab session. The students will be trained to execute all basic forms of design to apply for a floral designer position. This is a required class for job placement. The class offers business information on pricing for profit, daily sales, floral delivery expenses, and bulk purchases for profitability, and so much more! The students will have a final exam on materials covered during lectures. And every class day will be more fun than you can imagine and the amount of flowers to work with and industry information is fantastic! Students should bring something for note taking and a calculator. You don't want to spill water on your phone! The classroom has assorted tools available to use, new floral tools are provided for each student to keep, & additional types in the classroom for purchase. All other tools necessary for the class will be available. Registration & Class Materials for a 12-day class or 2 evenings for 12 weeks. Thank you for a wonderful learning experience. Before signing up for classes Dyana talked to other florists in the Kansas City area. They had nothing but praise for your program. I learned so much about color, texture, designing not just how to put flowers in a vase. Thank you for encouraging us to experiment & create. Your critiques were always positive, helpful and appreciated. The flowers were always beautiful. Your classroom showed quality, class and a lot of thought was put into every detail of your program. Kansas city and the surrounding are is lucky to have a program such as this. Thanks again for such a great learning experience. Thank you Pat for such a nice review....As we Explore Floral Design we have so many things to learn and practice. You are working towards being an amazing floral artist....have fun follow the rules and it always get easier the more you practice! I have florists contact me looking for students that graduate from the beginning class of Explore Floral Design and also experienced floral designers. Here is a new job position opening. David Austin Garden Roses shared these amazing images of the latest flower trends for weddings....Stunning! 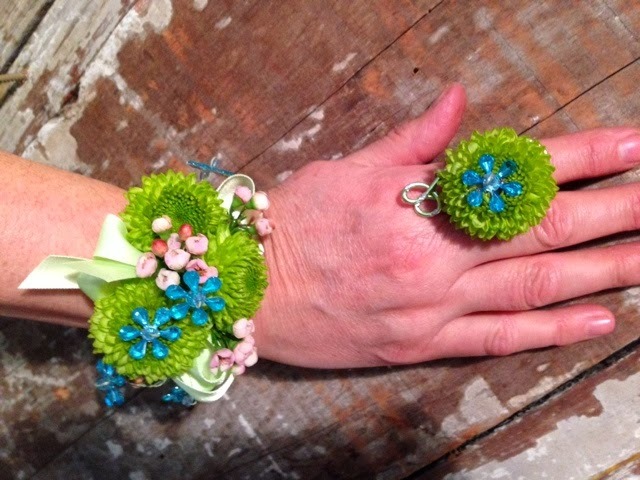 We are learning to create flower crowns and cascading bouquets in the classroom....join a Wedding class and explore new techniques & design style trends. New Covent Garden Flower Market. She's one of the persons behind the genius campaign that's taking place this week (June 15-19, 2015) called British Flowers Week. In its third year, the advocacy and awaress campaign has saturated UK social media with more than 1.5 million impressions of the #britishflowersweek. Completely inspired, and with the encouragement of many of you, Slowflowers.com will unveal and introduce American Flowers Week, scheduled for June 29 to July 4th, 2015. A blooming flag to get us inspired! Admittedly, given the short lead time, this will be a modest launch. But I believe that waiting until 2016 is a missed opportunity. And I want this to benefit YOU, your farm, your flowers and your own efforts to promote local flowers to your customers. 1. LOGO. You can see the concept at left, created by Iowa artist Jean Zaputil above. Jean is a talented designer and illustrator and she's stepped up to create a logo that we can all use. I will unveil the final image and share it on June 24th. 2. Americanflowersweek.com web site. Our Home page and About page are launched and the site is live! We will continue to add features including a press kit, more links and floral galleries. The site will also be imbedded in Slowflowers.com so anyone who lands there will learn about American Flowers Week. 3. PHOTO GALLERIES. Here's where you come in! I have created a new Slow Flowers Group Page on Flickr where there are 50 Galleries - one for each State. To make this a useful media resource, I want to feature photos of flower farms and floral designs from members in each State. The link to your photos will be included in our Press Kit and national press release. I will personally connect with lifestyle bloggers, home and garden editors and my other media sources to pitch them on American Flowers Week. I'd love your work to be showcased in that pitch! Please follow the link above to add your own photos to the group. Tag them with your name, your company name and your state name. Alternately, please send me your photos (including credit) and I will share! Please send your own news our way so that we can share it more widely. You can reach us at debra@slowflowers.com. Thank you for reading and for your involvement in the Slow Flowers Movement!